And while they looked steadfastly toward heaven as he went up, behold, two men stood by them in white apparel; Which also said, Ye men of Galilee, why stand ye gazing up into heaven? 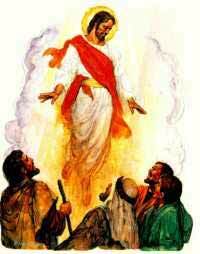 This same Jesus, which is taken up from you into heaven, shall so come in like manner as ye have seen him go into heaven." Acts 1:9-11. What a wonderful promise that it. The disciples were sad to see their teacher depart in such a manner, but the angels told them that Jesus shall return as the Lord of lords, the King of kings. The Lamb of God shall return to this earth in the same manner He left. He left in the clouds, and He will come back in the clouds. He had a real body when He left, and He will return the same way. He was visible when He left, and He will be visible when He comes again.